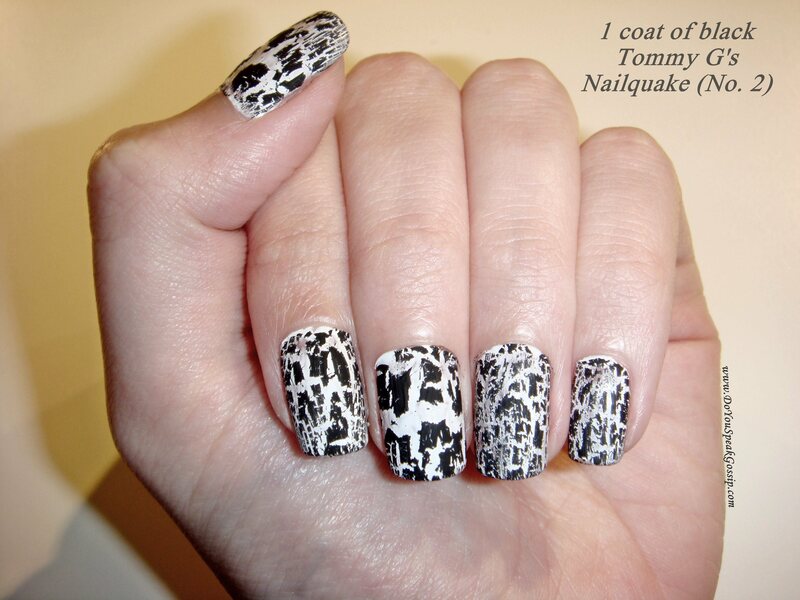 Nailquake – crackle nail polish - Do You Speak Gossip?Do You Speak Gossip? On my previous post, I showed you the result of nailquake polish, but my pictures weren’t that good, so I made a more detailed post about it. I bought nailquake back then, among lots of other nail polishes, ‘cause I saw many people use it. I didn’t know we had it here in Greece too, until I saw Veronica wearing it (and with a great success too!). I hadn’t used it till now, and I’m sharing my first experience of it with you. As I said in my previous post, I opted for a B&W effect, as it was shown in the bottle of it. This is what I used: Seventeen No.103 (white) as a base, Tommy G’s No.2, and of course base coat and top coat, both Artistry’s (by Amway). I didn’t pay much attention to the details, so I only painted one coat of the white base. This thing dries super-fast so you must be super quick too. It does a nice crackle effect, which leaves every nail with a unique style. Unfortunately, when it cracked, it took with it some of my base coat too, so it’s not the perfect manicure (It was my first try after all. I’ll try to do it better next time). The good thing is that you can only see this, if you are really close (as in the pictures I took). I applied one layer of top coat to make the nails glossy, and a second layer, to make them more smooth (because of the cracked polish), and more glossy. I found this manicure weird, but it gives a nice and special look so I liked it in the end. If you like this effect you should definitely try it. It’s very easy, and you have unique nails in no time. 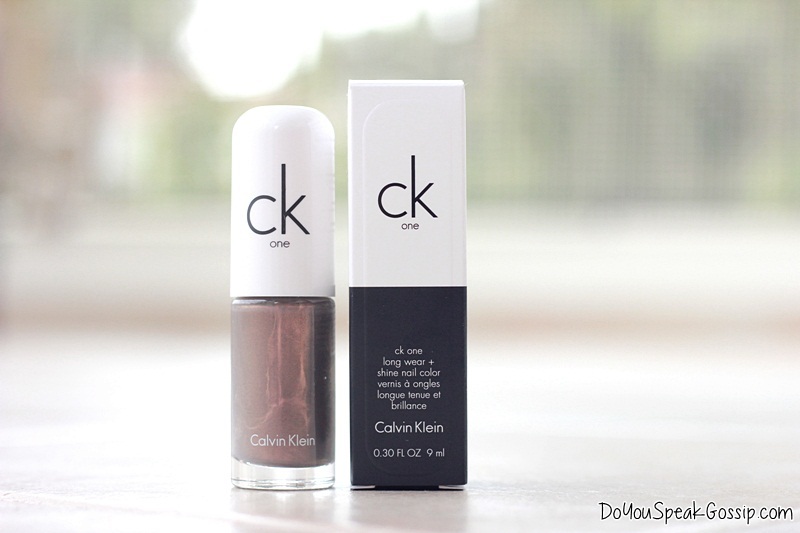 Have you ever tried crackle nail polish? Would you try it if you haven’t? S’euxaristw poli! 🙂 einai para poli eukolo na to vreis…exei polles etaireies pou exoune cracked nail polish…egw tin pira ap ta hondos center. ooo evge evge! an k den exw katali3ei an m aresei h oxi. alla….einai wraiotato verniki otan exei 3efloudisei h oza se kapoio nuxi k den prolavaineis na th ftia3eis…to pernas apo panw k ready! stegnwnei k amesws! koble!! Poli kali idea auti, gia otan xefloudizei to verniki! Tha to dokimasw…etsi k alliws k auto otan ksefloudisei den fainetai poli, sou kerdizei merikes meres akoma! Indeed, it gives a special look & I love it! Click here to join my giveaway! Oh that’s so cool!!! Love the cracked effect! W-o-w!!!!! I simply loooved it! Why, you know I’m the biggest fan of your nails! Simply amazing, just like your outfits: everytime you post the latest one, it’s more beautiful that the other! Now again: this time your nails were even more beautiful than with green or blue! I want to try this effect, but I don’t know where I can find this polish – I will try here in Germany, and for sure they must have it in England (on the 16th I’m flying and I think I won’t come back to Germany anymore!) So, thanks for sharing the step-by-step, I loved the result!!!!! Thank you Denise! To tell you the truth I wasn’t that excited with the result, but it’s something different. And you can experiment with different colors and see which one you like. I’m sure that you can find it both in Germany and England, if we have it here in Greece you can find it everywhere. 😛 We are always the last ones to get something new. There are many companies which have crackle nail polish, I think China Glaze is international and it has it. I totally agree with you and I’m happy to leave! It’s the end of an era, for sure, but the beginning of a new one – hopefully better! Yes, I have some good memories, but very bad ones too. I don’t know if I will come back – maybe. But it’ll take long, I think… I really had a “nightmare time” for the last 2 or 3 years here… I just want to relax a little now! I’m sure it will be a better era for you! And I think you’ll have more time to relax now. After all you just finished your 2nd masters. What are your plans for England? Will you continue your studies there, or find a job?You don’t have to answer me if you don’t want to, I hope I’m not being indiscreet. I’m glad you liked my country, and I hope you’ll visit it again in the future. I like that you travel so much. I was searching for plane tickets today and they are really expensive. I’m trying to find something cheaper to travel to Austria for a few days. That looks so amazing & chic! Love your blog! Glad you liked them, thank you for your visit! Oh my gosh these look so cool! I love the black and white together – it still looks very polished and chic! I used crackle nail polish when I was younger, I can’t believe they’re back in style again! Thanks for visiting and following us, looking forward to future posts! Thank you! I didn’t know that crackle nail polish was an old idea. Everyone seems to be crazy over them for the last year. I “discovered” them, a few months ago. Thank you Kristen! You should try it then, you ‘ll love it. ps: check out our giveaway (value 160€!!) on the blog by CLICKING HERE! Loving this, I need to jump on the crackle bandwagon! Yes you should! hehe Thank you for your comment and for visiting my blog! Have you entered my Clinique give away? Thank you! It’s really easy, you just paint a base color and then one coat of the crakle nail polish and you’re practically done.